Author: Bogdanos, Matthew Set In . 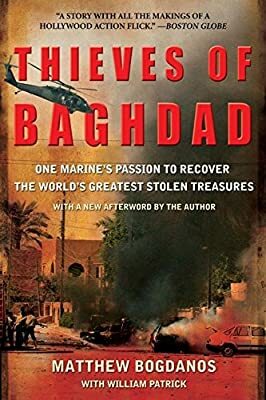 . .
Thieves of Baghdad is a riveting account of Colonel Matthew Bogdanos and his team's extraordinary efforts to recover over 5,000 priceless antiquities stolen from the Iraqi National Museum after the fall of Baghdad. A mixture of police procedural, treasure hunt, war-time thriller, and cold-eyed assessment of the international black market in stolen art, Thieves of Baghdad also explores the soul of a truly remarkable man: a soldier, a father, and a passionate, dedicated scholar. Matthew Bogdanos has been an Assistant District Attorney in Manhattan since 1988-where New York tabloids call him "pit bull" for his relentless prosecution of criminals such as the 15-year-old "Baby-Faced Butchers" for their 1997 grisly Central Park murder and rappers Sean "P. Diddy" Combs and Jamal "Shyne" Barrows for their 1999 shootout. A colonel in the U.S. Marine Corps Reserves, middleweight boxer, and native New Yorker, he was raised waiting tables in his family's Greek restaurant in lower Manhattan and holds a classics degree from Bucknell University, a law degree and a master's degree in classics from Columbia University, and a master's degree in Strategic Studies from the Army War College. Commissioned a Second Lieutenant in the Marines in 1980, he served as a Judge Advocate until he left active duty to join the District Attorney's Office, rising to Senior Homicide Trial Counsel in 1996.